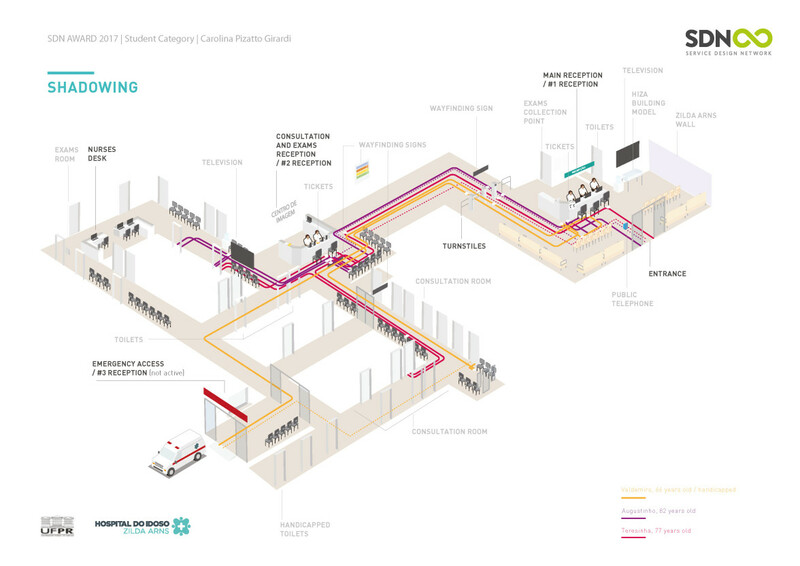 This project by Carolina Pizatto Girardi is shortlisted for the Service Design Award 2017 in the Student category. The Elderly Hospital of Curitiba, in Brazil - Hospital do Idoso Zilda Arns (HIZA) had a series of issues that were negatively affecting their patients satisfaction yet weren’t known by the hospital directors. They didn’t know where the problems were or where to begin in order to improve the service provided. To solve this situation and to support decision making, this project identified and mapped all of the service’s weaknesses, and delivered co-created solutions for each of them. 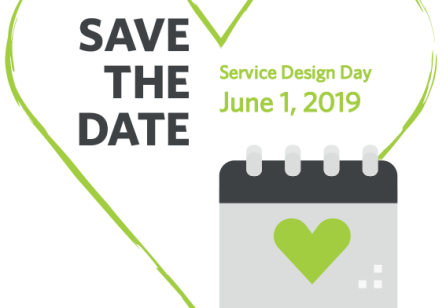 As a service designer, my role was to analyse the hospital’s flow, identify the priority section to focus on, plan and conduct research to highlight the issues within it and with the input of the stakeholders, facilitate the ideation and prototyping of solutions. The result is focused on reducing user’s uncertainty and anxiety towards the service, by providing them with information and emotional engagement. The number of complaints related to public services in Brazil is colossal, especially when dealing with public healthcare. 80% of the population depends exclusively on public healthcare services as the only way of access to health. This represents close to 151 million people. 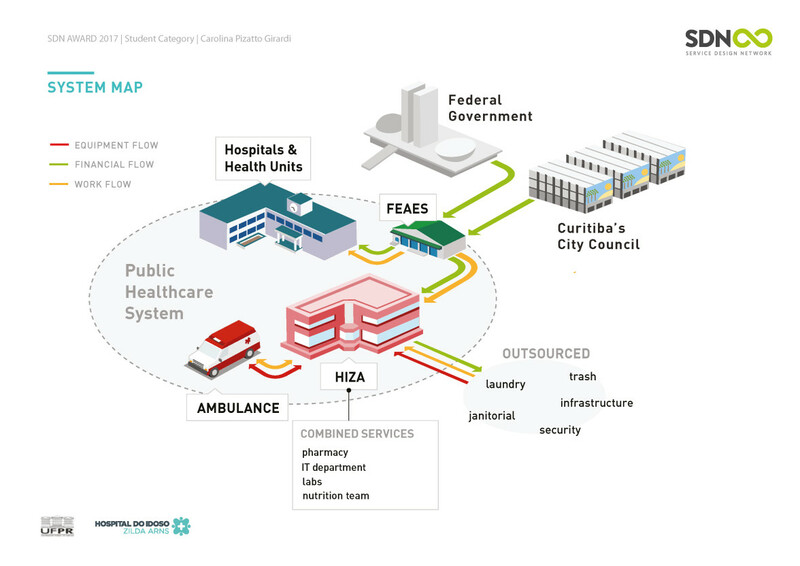 Even though, only a small portion of the Federal Government and Curitiba’s Council budget is addressed to improving these services. In 2014, this portion was 1% and 16,9%, respectively. HIZA was specifically chosen as it is the main public hospital in the state specialised in the elderly, which is the fastest growing population segment in the country. This project highlights which of the current service touch points needs more attention and how to use the current investment more effectively to improve the experience for appointments and exams. Patients, doctors, nurses and caregivers were involved in all three stages of the process. After the research stage, they worked together in co-creation and prototyping workshops to define how the new service should be. Throughout the research process, 10 design tools were applied. Used in combination they would contribute towards each other as well as obtain their own unique results. The combination of qualitative and quantitative research methods allowed the patient’s insights to be crossed with quantitative data, demonstrating frequency, weight and the priority of each insight. All research information collected was gathered on a chart, from which positive or negative judgment was extracted. 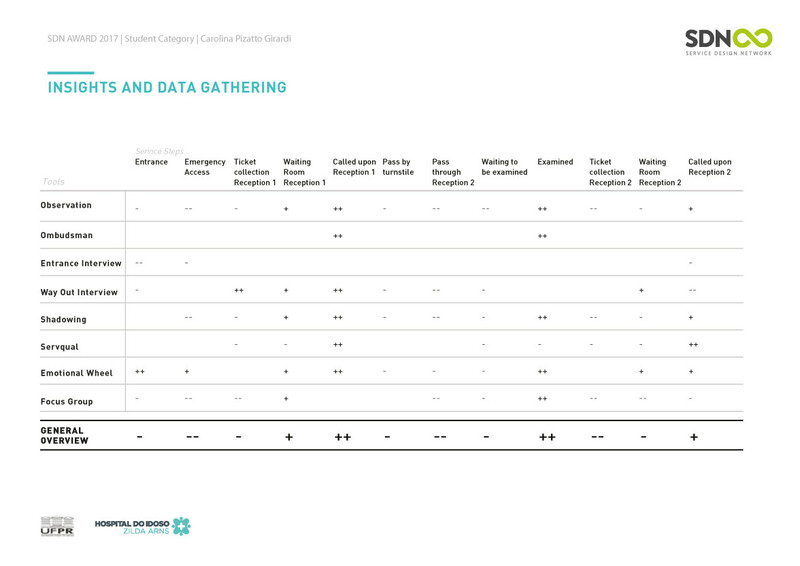 This table was used to determine current customer satisfaction at each service step. 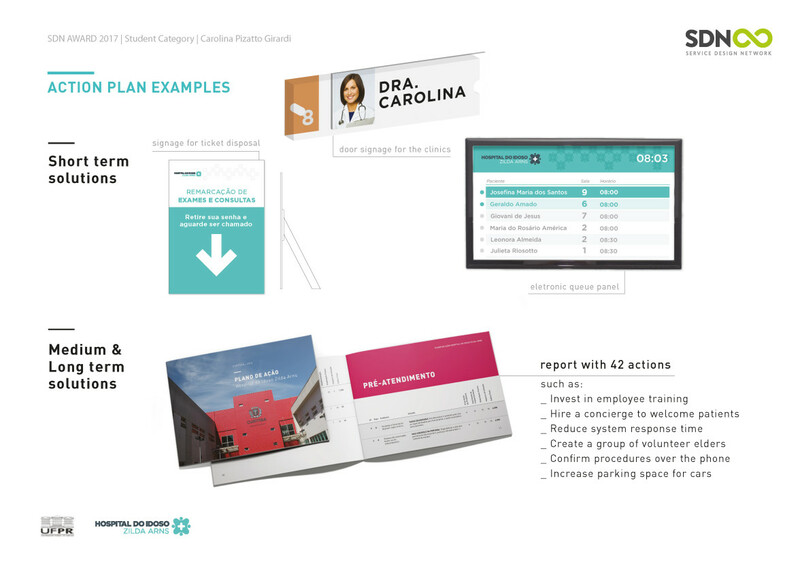 Later in the process, the research findings were presented to designers, staff and patients in 3 different co-creation workshops. Each workshop consisted of a range of different creative exercises to instill new thinking on old problems. 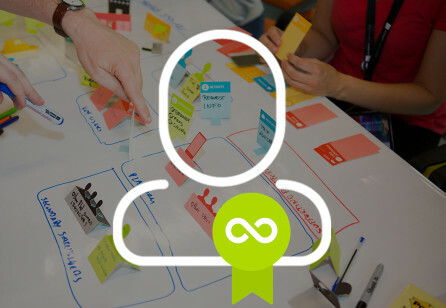 These exercises included Brainstorming, ‘Tomorrow Headlines Statements’ and ‘Lego Prototyping’. 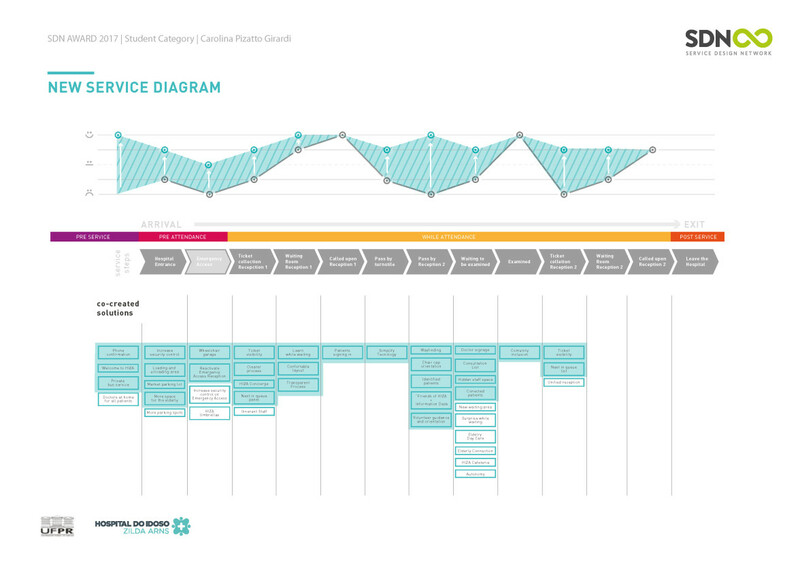 As well as the construction of the ideal service journey, another outcome of this project was an action plan including 42 challenges and their solutions, classified by short, medium or long terms. Each challenge was ranked by the criteria: problem priority, solution feasibility, viability and impact. This report was extremely valuable for the organization. It brought user centered guidance to improve the service and patient’s satisfaction, but also strong data to attract bigger investments and new partnerships. From a patient’s point of view, the implementation of the recommendations would help patients to feel less anxious, better welcomed, more informed and well engaged. 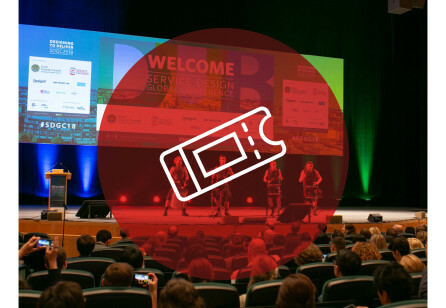 “This project is considered the most complex service design work ever done in the Design BA degree of the Federal University of Paraná, in Brazil”, said Professor Msc. Ricardo Martins, who was the tutor of this project. 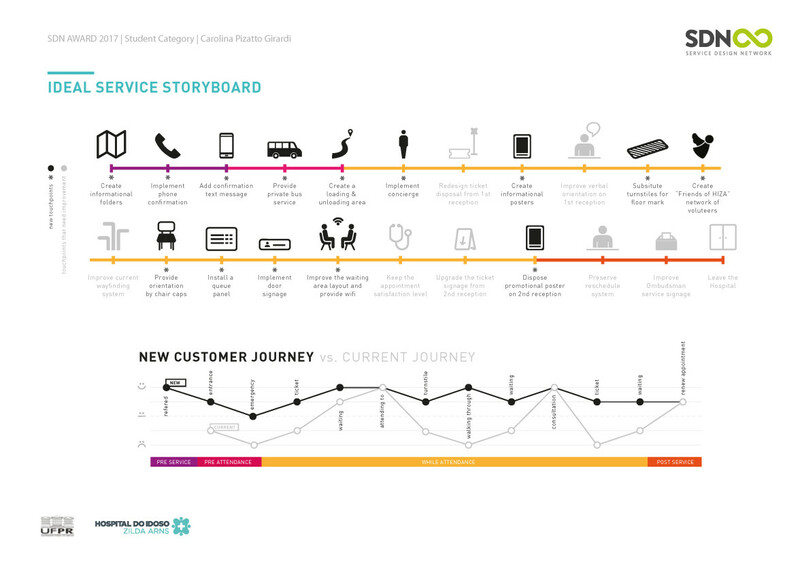 Service design projects often rely heavily on qualitative methods such as interviews and ethnography. But this project is different because it cleverly combines not only qualitative but also quantitative research methods. The exploratory methods allowed knowing the main difficulties that the elderly faced in a hospital environment, while the descriptive ones were able to quantify which problems were a priority from the point of view of frequency, indicating which issues should be addressed first. The action plan not only shows the solutions but also helps to prioritize which ones should be done first, a feature that fills a gap quite common in service design projects. 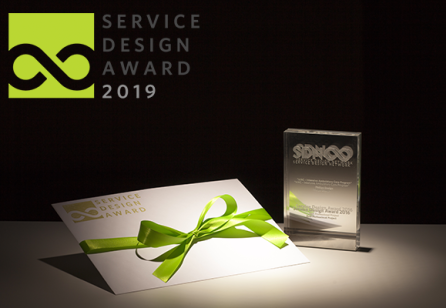 “Although this project has already been awarded in Brazil, I am fully convinced that it deserves international recognition due to the robustness of its method, which will serve as a future reference for other health service design projects.” Martins added.